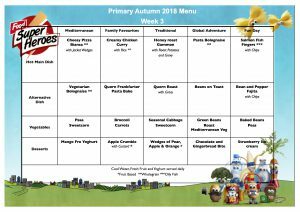 Our school meals are provided by Chartwells and offer a healthy, balanced meal. Menus are offered on a cycle and a hot meal, vegetarian option, sandwiches and jacket potatoes are offered daily. There are also regular meals to celebrate special events. 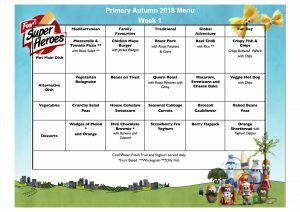 Children can have hot dinners or packed lunch on a weekly basis. If you require a change in lunch arrangements you must inform the office in writing. Please ensure that payment for hot dinners is sent into school on Monday’s, in an envelope with your child’s name and class. Children may bring a packed lunch to school. This should be clearly labelled with your child’s name and class. In line with our healthy schools policy please try to ensure that you provide your child with a healthy packed lunch. Energy drinks are NOT allowed. We recommend that sweets and chocolate are kept to a minimum and maybe included as a treat on a Friday. As part of our on-going commitment to the environment we recommend that you use insulated lunch boxes and reusable plastic containers. All children in Reception and KS1 are entitled to free school meals. However, it is important that if you qualify for free school meals that you apply as school obtains additional funding. Some older pupils will be eligible for Free School Meals based on individual circumstances. Please click the following link to download an application form, http://liverpool.gov.uk/schools-and-learning/grants-and-funding/free-school-meals/ or contact the school where we can provide support in completing the form. At Florence Melly we provide food throughout the school day for our pupils/students staff and visitors. The school catering company Chartwells is responsible for the food provision at the school. Our catering manager is based in the school kitchen between 8.30am and 1.30pm. Please contact the school office and make an appointment if you would like to discuss any allergen issues your child may have. Children are encouraged to drink water throughout the day and each year group has filtered water available. Fruit is provided for children in Early Years and KS1. Key stage 2 children are encouraged to bring fruit or a cereal bar.